In the course of their operations, railroads issued an enormous amount of paper items of various kinds, and just about all of these are of interest to collectors. Of course like any other collectible, scarcity is a main determinant of value, so some items that were produced in small quantities -- like passes -- have more value than common items such as bills of lading. Also, paper items from obscure but popular railroads such as the Colorado narrow gauge lines command more attention than similar items from the larger, more well-known companies. Lately it seems that paper collectibles have come into their own with impressive auction prices being realized for older public timetables and passes. However, all things considered, paper still represents a good entry point to railroadiana-collecting since many items are still obtainable for reasonable prices. Railroad paper was produced for four basic audiences: investors, the public, shippers, and employees. Investors were the first audience for the obvious reason that money had to be raised for construction. However, this rapidly changed to the traveling public and shippers in order to raise revenues. When the majority of ordinary people traveled by rail, a great deal of advertising was aimed at enticing travelers to choose a particular railroad, route, or vacation destination. In the first decades of the twentieth century, travel promotion reached a high art form with specially commissioned illustrations and artwork. Today much of this art, in the form of posters, public timetable covers, luggage stickers, and other items, are especially prized by collectors. At one time, the prevalent philosophy among railroad management was that an attractive passenger service led to increased business in freight traffic, so passenger business promotion was also considered an aid to the freight business. However, there were special paper items aimed at shippers and companies, most notably maps that illustrated the obvious convenience of a particular route. In terms of quantity, probably the most paper generated by railroads was for the benefit of internal operations, for example, employee timetables, train orders, rule books, and other operational documents. Annual Reports. These documents were produced primarily for stockholders and investors and, therefore, are sometimes overlooked as the specialty of economic historians. However, a wealth of information regarding operations and equipment can be obtained from such reports in addition to financial matters. Generally, annual reports were no-nonsense documents meant to convey financial solidity and propriety rather excitement. Usually they have plain covers, although starting around the 1950's, railroads started issuing annual reports with flashier cover designs and pictures in the interior. Many early annual reports contained attractive maps that were elaborate documents in their own right. In fact, many railroad maps that show up in today's market were originally published in the back of annual reports. Right: An 1893 Annual Report from the Chicago, Milwaukee & St. Paul Railway, with a typical plain cover. Blotters. Before the advent of ball-point pens and when fountain pens were the dominant writing instrument, an inexpensive and effective promotional item was the blotter. Typically about 4 by 8 inches in size, blotters were used to promote freight or passenger service and frequently provided information on specific trains or routes. They could be quite colorful and often featured special artwork. Right: A blotter advertising the "Night Hawk", an overnight train between St. Louis and Kansas City operated by the Burlington (Chicago, Burlington & Quincy Railroad and the Alton Railroad, date unknown. Calendars. At one time, it was common practice for railroads to issue an annual calendar as a promotional item. In the first half of the 20th Century, calendars were usually illustrated with specially commissioned art, some of it achieving great acclaim and artistic recognition. Probably the two most famous series in this regard were Winold Reiss' magnificent portraits of Blackfeet Indians which graced the calendars of the Great Northern Railway over roughly two decades, and the paintings of Grif Teller which depicted dramatic industrial scenes along the Pennsylvania Railroad. By the early 1960's as passenger traffic dwindled to the point of no return, most railroads dropped the annual calendar as a promotional device, although a few railroads, notably Norfolk Southern and Union Pacific have continued the practice to the present day. Today those early 20th Century calendars that have survived are eagerly sought by collectors, with special emphasis placed on completeness (full calendar pads) and, of course, good condition. Right: A 1938 wall calendar from the Chicago, Burlington & Quincy Railroad, A.K.A. the "Burlington". Employee Timetables. 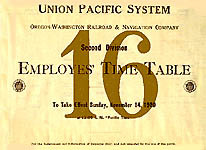 Railroads have always issued timetables for the exclusive use of their employees, a practice that continues to this day. Typically such timetables provide information on physical plant, tonnage ratings of locomotives, special conditions along the line, schedules of regular trains, and other information of vital interest to railroad operation. Probably no other single document gives such a telling picture of a railroad's operation in a particular time period. In appearance, employee timetables tend to be plain, no-nonsense booklets. Early examples were often large in size (roughly 8 inches by 14 inches), and these are sometimes referred to as "horseblanket" style. Gradually railroads switched to the standard "timetable size" variety (4" by 8"), although this transition did not occur all at once. According to Tom Greco, Eastern roads were the first to do so, with Midwestern and Western roads generally making the switch in the 1930's and 1940's. However, one railroad, the Canadian Pacific Railway, used the large size until 1967. In recent years, many employee timetables have been issued in binders. Right: A "horseblanket style" employee timetable from the Oregon, Washington Railroad & Navigation Company, a subsidiary of the Union Pacific system from November 14, 1920. Luggage Stickers. A seemingly lost practice among transportation providers is the issuance of colorful luggage stickers to place on suitcases and trunks. Railroads did this at one time, and many of these were vivid and colorful. 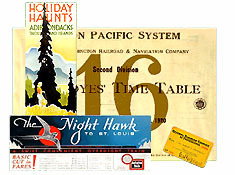 Right: A luggage sticker from the Chicago, Milwaukee, St. Paul & Pacific Railway advertising its premier "Olympian" passenger train to the Pacific Northwest. Maps. Since railroad construction literally put many towns and place names on the map, it is natural that railroads would take a leading role in issuing maps of their territory. As mentioned above, many early maps were produced in association with materials aimed at investors; however, gradually they were seen as a means of promoting both passenger and freight business. There were essentially two variations here: the folding map and the wall map. The former could be quite large when unfolded but was printed on fairly light-weight paper and folded into a timetable size document for storage. In contrast the wall map was printed on heavier weight material and designed to be displayed rather than folded. Old photo's of railroad business offices frequently show a wall map prominently displayed, and not uncommonly, the map is from another railroad! Regardless of whether it was a folding map or wall map, the railroad's lines would be shown in the context of the entire country or, less commonly, only in the portion of the country where the railroad operated. The railroad's own lines were always highlighted prominently, while competitors' lines were faint by comparison. Also the lines would often appear to be more direct (straighter) than they actually were, obliterating, for example, a jog that the line actually took to avoid a mountain range. This was, of course, intended to convince a shipper that the route was in fact a "straight shot" and therefore the best choice for a shipment. Map collecting is a hobby in its own right, and since many early domestic maps were railroad-originated, there is little wonder that fine, early railroad maps command serious interest ($$). Right: A desk map folded "timetable size" and issued by the Southern Pacific Railroad in the late 1920's. The "Four Great Routes" refer to the "Sunset Route" between New Orleans and San Francisco, the "Overland Route" between Chicago and San Francisco, the "Shasta Route" between San Francisco and Portland, and the "Golden State Route" between Chicago and Southern California. Menus. To compete for business in the heyday of passenger train travel, railroads operated first class food service in their dining cars. These were literally restaurants on wheels, complete with special china, silverware, linens, and, of course, menus. To examine such menus from our vantage point in time is to be impressed by the type of food that could be freshly prepared in a rocking dining car kitchen little bigger than a closet. Also impressive are the low prices, although these naturally have to be judged in light of the pay scales of the day. Many railroad menus were produced with beautiful covers, sometimes customized for special charter groups. Early examples often featured illustrations and artwork on their covers, while later examples (from the1950's on) tended to use photographs. Right: A menu from the Canadian Pacific Railway dating from the late 1920's and featuring a beautiful cover on the Maple Sugar Industry. This menu lists a broiled half chicken for $1.25 and a sirloin steak for $1.50. Name Train Brochures. When railroads instituted a new train, particularly one with a special name, they often produced brochures to announce the event. This was especially true during the "last hurrah" of private passenger train innovation -- in the late 1940's and early 1950's when many railroads rolled out postwar streamliners in an effort to revive the passenger train business. From observation, the name train brochures produced during this period show some of the finest commercial illustration and design quality of any category of railroad paper. Because of their relatively new vintage, these brochures have tended to be rather inexpensive until recently when collectors have begun to recognize their esthetic value. 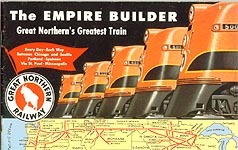 Right: A name train brochure from the Great Northern Railway introducing its new, streamlined "Empire Builder" in 1949. Passes. From the very beginning of the industry, railroads occasionally needed to provide free transportation to individuals. For example, officials of other roads were sometimes given a tour of the lines, prospective shippers were invited to examine facilities before agreeing to contracts; employees needed to be transported to a work site, and so forth. The mechanism for regulating such free transportation was the pass. Typically a pass took the form of a small piece of cardstock, about the size of a modern credit card with dimensions that allowed them to fit in a wallet. Passes can be found from extremely early and obscure railroads, including those that had little or no passenger service. In this respect, passes represent one of the few tangible remnants from many long-gone lines. Right: An 1899 pass from the Pittsburgh & Western Railway. Public Timetables. Passenger train or "public" timetables can be found in a variety of forms, from plain, single-sheet schedules describing service by a single railroad to large, poster-size schedules (called "broadsides") that typically describe all the arrivals and departures of one station. Most common are "timetable size" (4" by 8") booklets issued by a single railroad covering all passenger trains operated by that company for a given time period. Like employee timetables, passenger timetables offer a fascinating insight into railroad operations during a given historical period. All timetables provided arrival and departure times for specific trains, but many also provided information on equipment assignments (number of coaches, sleeping cars, etc. ), fares, travel advice, and route descriptions. Some were rather plain and utilitarian in design while others were quite colorful with ornate cover art. The collection and study of passenger timetables constitutes a specialty within the hobby, and there is even an organization devoted exclusively to this activity. Right: An January, 1904 public timetable from the Oregon Railroad and Navigation Company. By this time in history, the O.R. & N. Co. had become affiliated with the Union Pacific System, hence the latter's "Overland Shield" logo on the cover. Postcards. In the early part of the twentieth century, when railroads were at their zenith as passenger transportation, a immense number of postcards were produced of railroad scenes. Typically these were used as a means of communication when traveling or sightseeing. Specific subjects included railroad stations, scenic rights-of-way, rolling stock, railroad engineering landmarks, and even wrecks. Railroad postcards are fascinating today because they provide a glimpse of a different era of travel, and many show scenes that are long vanished. 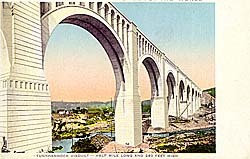 Right: A postcard of Delaware, Lackawanna & Western Railroad's Tunkhannock Viaduct shortly after it was built around 1915. This landmark still exists and is in use. Route Guides. Railroads met their passengers' interest in the route they were traveling with guides that described points of interest along the way. In some instances, there were separate versions of these guides for each direction (East and West or North and South). For the most part, such guides were produced only by those lines that traveled appreciable distances through areas known for scenic beauty, both in the East and West. They are particularly interesting nowadays in describing cities and localities as they existed a half century or more ago. 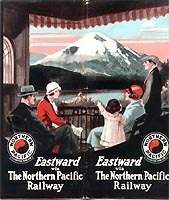 Right: An "Eastward" route guide produced by the Northern Pacific Railway. It dates from the 1920's. Rulebooks. Railroads typically published a wide range of little booklets for employees covering rules, regulations, tariffs, union agreements, and other necessary operational information. These are almost always pocket-sized, about 3" by 5" and usually have plain, brown covers. Illustrations in these booklets are minimal, usually consisting of signal indications and other simply drawn diagrams. In the case of rule books, however, their plainness was no indication of importance. Since all operating employees had to pass rules exams, these books were intensely scrutinized, and it is not uncommon to find surviving books that are especially worn and full of notations. Right: A rule book from the Western Maryland Railway dated 1915 and entitled "Rules and Instructions Governing Free Travel and Passes." The contents of this book are presented separately on this website. Settlement Publications. Publications that were designed to entice settlement rather than just travel were common in the early days of railroad construction, most particularly in the West. The Western U.S. and Canadian transcontinental lines were built through remote territory that had little on-line business or population, so one of the main efforts of early railroad builders was to promote settlement along their lines. Accordingly, they produced booklets of statistics and information related to farming, ranching, and other livelihoods to be distributed both domestically and abroad to prospective settlers. Of course, the general tone of these publications was one of future success and prosperity, and undoubtedly more than one settler discovered that the picture presented was a little too rosy! Right: A 1914 settlement booklet from the Great Northern Railway describing the benefits of taking up residence in the state of Washington and province of British Columbia. The booklet was part of a series of booklets providing "accurate information for the land-hungry." Tickets and Ticket Folders. Tickets for passenger train travel were issued in the millions but good examples are not necessarily that common. After all, they were of temporary value and most were collected and destroyed. How many of us save the remnants of our airline tickets? In addition to the tickets themselves, the ticket envelopes that accompanied them are also very collectible, especially those that are colorful or illustrated. Right: A ticket issued by the Baltimore & Ohio Railroad for a trip from Washington, PA. to Wheeling, WV on a special college excursion train, Saturday, June 17th, 1911. Travel Brochures. To promote vacation travel, railroads issued attractive booklets describing the qualities of destination points served by their lines. In fact, specific railroads became strongly associated in the public mind with particular geographic localities, for example, the Great Northern Railway with Glacier Park, the Atchison, Topeka & Santa Fe Railway with the Grand Canyon, and the New York Central Railroad with the Adirondack Mountains and Hudson River Valley. Because these brochures were usually aimed at the leisure traveler, attractiveness was critical. Covers were often illustrated with special artwork, and interiors usually contained enticing drawings or photographs as well as richly evocative descriptions. Today these brochures describe a view of travel that is notably different from the contemporary emphasis on thrills and theme destinations. While not ignoring exciting activities, they seem to put more emphasis on serenity, relaxation, the subtleties of nature, and a strong sense of place. Nostalgia for a different, seemingly lost approach to travel is a major side effects of reading these brochures. Right: A brochure by the New York Central Railroad describing the beauties of the Adirondack Mountains, Thousand Islands area, and Saratoga Springs. It dates from the late 1920's. Summary. The categories of railroad paper discussed here are by no means exhaustive. Some additional categories of railroad-originated paper are employee magazines, recipe booklets issued by railroad dining care departments, stock certificates, and informational booklets describing facilities such as yards. To these can be added the enormous variety of forms - train orders, bills of lading, dispatcher sheets etc., -- that were used in day-to-day operations as well as business documents such as correspondence and letters. But wait...there's more. Documents issued by some railroad suppliers and manufacturers, for example catalogs from Baldwin Locomotive Works or Adams & Westlake, makers of lanterns and railroad hardware, are generally considered railroad paper. So the list is almost endless. The good news is that much railroad paper is still relatively inexpensive compared to hardware such as lanterns. In addition, there is much history in this paper -- not necessarily the grand history of corporations but rather the history of day-to-day life as it was experienced by travelers, employees, and anyone else who had some contact with the railroads. Probably no other category of railroad collectible offers such a rich potential for new information. Further Reading: Only one book has been published on the general topic of railroad paper, although other books have discussed it in the context of general railroadiana. That one book is by Brad Lomazzi's Railroad Timetables, Travel Brochures & Posters, published in 1995 by Golden Hill Press, Spencertown, NY 12165. In addition, Carlos Schwantes' Railroad Signatures Across the Pacific Northwest, published by the University of Washington Press in 1991, has an extensive discussion of the use of printed materials by railroads in this region as well as some beautifully reproduced examples.